I went to Detroit today to try the Mad Anthony cyclocross race. The race is held on the site of the historic Fort Wayne right on the Detroit River across from Canada. The fort dates back to the pre-Revolutionary days. (If you are unfamiliar with cyclocross racing, check THIS wikipedia or google cyclocross videos). I decided Friday afternoon to do both the C and the B race. I was a bit concerned about racing just the B event since this was a USAC-licensed event, the rules are that when you are lapped you must drop out and I didn’t want to drive over to get lapped and pulled from the event. Looking at last year’s events, team captain Rick placed approximately 23 of 25 racers that were considered finishers with a dozen “lapped” riders behind that. If Rick was close to the bottom and I am slower than him, I was concerned about holding my own on this event. So, to make the drive worthwhile, I opted to race BOTH the C and the B race. I figured I’d be fairly safe racing C and finish the event. Then, racing B, I’d get a couple laps in and if pulled, I’d get some mileage anyway. Turned out they didn’t pull racers, but they did post results with those “lapped” racers as a lap down. Turns out, I wasn’t in that category in EITHER race!! The course was approximately 2.35 miles long starting inside the fort and making a quick hard right on the outside moat to circle the west and north side of the wall before turning back and heading up on the grass. The course had one long stretch of pavement fronting old NCO housing units, up on the grass after that, followed by a hard run-up hill and down onto a long long packed gravel flat stretch around a soccer field. The NCO-road and this packed gravel really favored the sprint roadies who churned out RPMs to press a lead. Back to the fort, we’d ride in the south and east wall moats and into a tunnel in the wall which lead into the center fort parade ground where some tight turns in the center led to a couple tough climbs which most riders actually had to run up. A final turn and over the barriers, up&down a hill and through the chute to start all over again. Joni and I drove over at 7am, reaching the fort at about 930 to get in line to pick up registration and paperwork. The registration was swamped so they moved the C race back from 1030 to 1045. There were 81 “C” racers- quite a crowd! The C race was not divided by age or categories- just 81 racers all competing against each other- and that didn’t count the women who were also out there as their own group. Founders-Alger-Racing teammate Scott Thenikl was also there for the C race. The crowd took off, turned out of the fort and made that hard right turn into the moat. After the next turn in the moat a rider went down and the crowd split around him and I surged around a couple riders after we passed the downed racer. I rode pretty hard and the C race ended up being only three laps for just over seven miles in that 30-35 minute event. I saw quite a few racers behind me during the last couple laps. I finally finished and looked at the clock as I crossed the finish line at 32 minutes and some seconds. Scott came across the finish line a couple minutes later. I ended up at 27th of the 81 racers with many of them at the bottom counted as “lapped” and thus down a lap in the results. Scott was 30th of the 81 C racers. There was a fifteen minute or so break and the B races started lining up. This also looked to be quite a crowd. Results showed it to be 65 racers. This B race was not divided by age or USAC category- so I was racing USAC categories of 2, 3, and 4. This was the race I figured I’d be really out-classed. Turns out I held my own. The race ended up being 5 laps which I completed in just over 55 minutes. I rode as hard as I could and got passed at one point by speedster Mackenzie Woodring of the Bissell team, one of west Michigan’s fastest women racers. The was on a mountain bike. She was shouting out encouragement to a woman Fusion team rider and I tried to hang in there with them on a paceline but they all pulled away from me before we hit the fort’s south moat. So I focused on the nearest male rider and tried to close the gap over the course of the next lap. I did eventually pass the nearest one and over the course of lap four and five increased my lead by a huge seven minutes (which surprised me). I crossed the finish as the announcer indicated I was the last “**official” finisher to garner a 43rd place of the 65 racers in the B race. (**Results posted later, though, indicated one more “official” finisher after me- he finished at 62 minutes – the seven minute gap. All in all a successful race- I went there with the modest goal to do decent in the C event and to try to hold of getting lapped in the B race and exceeded both goals fairly well!. Joni and I drove around downtown Detroit for a little while as the A racers were on their last lap before deciding to eat dinner at one of the race’s sponsors- Los Galanes in Mexican Town. The food was really good. Joni had a chicken mole’ dinner and I was able to order a vegetarian stir-fry cactus dish. ( I like fried cactus too ). The fort is a completely under-utilized property! If it could be really utilized it could be Detroit-area “Mackinac Island” with recreational activities too! Joni wandered the fort and the old structures taking, taking photos as I raced. We will definitely return next year. My job requires periodic trips to McAllen Texas where I drive across the border to the supplier in Reynosa Mexico during the work week. I’ve wanted to bring a bike – road or mountain- but the cost of shipping or flying a bike is so expensive that it has always been prohibitive even for the few times my trips are more than a work week long. I came up with an idea to buy a bike at a pawnshop just to have something to pedal, but three outlets I stopped at didn’t have a bike in my size to make this a viable option. Then, one of my contacts at the supplier, who is also a supplier, told me Tuesday he had a mountainbike I could borrow. He brought it in Wednesday- a Raleigh. I took it for a tune up ride Wednesday night. Today I rode it out to the Mission Trail system in Mission Texas, a nearby town to McAllen. The ride out was ten miles. Once at the trails, I rode the mountainbike loops. The trails also have a single out&back paved track too. Mission Trails can be considered the Texas version of Bass River. There is not much elevation but the trail builders put in a whole lot of mileage in a confined space. The only significant climbs are on the outer boundaries north and south when they run the trail up a short steep incline onto the levee that borders each side, after which they dive the trail back down into the Texas scrub. Clearly the foliage is different- notice the cactus. And it’s funny to see little desert lizards scooting across the trail instead of chipmunks. The tread is hardpacked and fast, though, and mostly clay based. You can see some severe tire ruts in a few sections where someone had ridden the trail when wet and the clay set up. But erosion isn’t really an issue here. Cactus is, however. At one point, I had some foliage stuck to my front wheel and it was whipping around on every revolution, so I pulled it off the tire and heard a faint “phttt” sound as a small amount of air escaped. I held my breath but no instant deflation occurred. I considered I might have a slow leak, so I continued my ride for another half hour before heading back to the hotel. So far the tire is holding so perhaps the air that escaped when I removed the cactus thorn was simply air trapped between the tire and tube- meaning the tube is not pierced. I plan to ride Sunday as well, though I am torn. There’s a 35 mile road race in Edinburg which I can’t really enter since I didn’t do the time trial today and am riding a mountainbike instead of my road bike. The event is at 730am, so I think I will be better off doing another ride out to the Misson Trails and forgo the road event, even as a spectator. I took another ride out to Mission Trails this morning. I encountered Jaime on his road bike- he is the guy that loaned me the mountainbike. He was on a morning road ride. We rode in the same direction for 3-4 miles and he turned off northward as I proceeded west toward the trails. Update- 10-2-10 I took my first tumble today, climbing a small rise in the embankment. Not familiar with the trail I failed to shift down quick enough and stalled on the climb. I put out my left foot to dismount to walk the last few feet to the top, except- when I put my foot down on the grass- there was nothing underndeath it! It was that long grass that basically hung over thin air- I fell over the left side and down the embankment about five feet, landing on grass and rocks. No injuries, however, just a scraped elbow and cut finger on a sharp rock. Here’s a photo of the “Pooh Forest” segment of the trails. Big guys like Rick, Ralf and Ernie would NOT be comfortable in this section. Rick asked about mileage- it’s tough to determine. I asked three different riders at the trail head and got three different answers. But there appears to be 10-14 miles of trail at least. 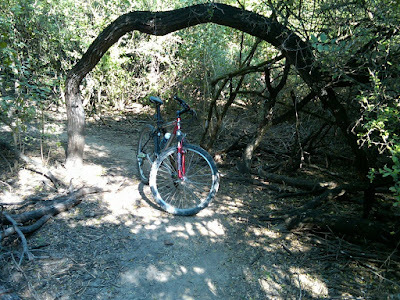 However, I rode some of the loops farther out from the trail head today and they are definitely not maintained- really overgrown, likely not ridden as much as the loops closer to the parking lot. There is apparently controversy on this land as well. I tried the link to the local mtb organization but their site is down, so I googled their cached site. Apparently the local govt authorities “leased” the whole property to a gun club for ONE DOLLAR! WTH?! Photos from the cache shows many cyclists with signs protesting at a city council meeting. The city said they didn’t “know” about the biking and hiking at that land unit since the Parks&Rec board was only an advisory board and didn’t tell the mayor about it. Really? I’m not even from the area and I KNOW about these trails yet we are to understand the mayor and city council don’t know about a regular hiking and biking location on city owned property that actually has a parking lot and a kiosk sign with a map? Really? 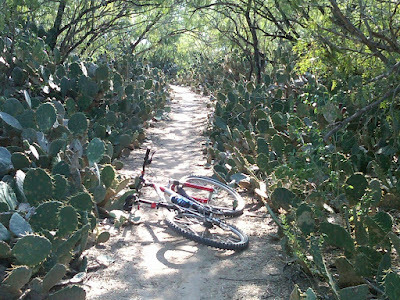 Unfortunately, there doesn’t seem to be a strong mountainbiking culture here in the lower Rio Grande valley- there seems to be limited trail opportunities as well as clearly civic institutions don’t recognize mountainbiking. Most cycling I’ve seen here is road riding and I’ve not found another mountainbike location nearby in any research I’ve done.